"Tricetal [a French label] put it out in Europe," comments Elinore Blake, better known as April March. "Then we worked out a licensing deal for the U.S. Because of the needs of Tricetal I couldn't go with Sympathy for the Record Industry [who put out March's last U.S. release]. Play-It-Again-Sam Records put an offer on the table, we liked it, so we went with them." "They give tour support," she continues, "which is what we needed for the U.S."
So goes the story of Triggers, April March's latest release and first non-Sympathy for the Record Industry release in the U.S.
March, however, is excited and happy with her decision. "They are a very tasteful indie record label," she tells me. 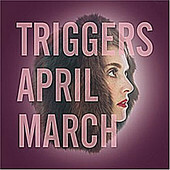 Triggers continues with March's retro-pop/French delight sound, playing like a soundtrack of the 60s in France. However, unlike previous releases, Triggers relies less on nostalgia and more on songwriting, allowing March and producer/co-songwriter Bertrand Burgalat to breathe and roam, exploring new territories where previously they were limited. "We wanted to be able to let go and have the album take on its own life," she says of Burgalat and her own goals for the record. "That's what we set up to do and were very happy with the end result. It took on its own life, and part of that was because I was more confident." Happy with her own writing abilities, and happy working with songwriting partner Burgalat, March reaffirms her stance as one of the best non-French born French-pop songsmiths, while also allowing Triggers to showcase her other musical styles. And, although the record took some time to make - Chrominance Decoder, her last full-length, was released in 1999 -- the record seems well worth the wait, showcasing March's progression as a vocalist and songwriter. "[Triggers] was about schedules to get it done more than anything," March admits on the making of her latest. "We recorded it in Paris and went over a few times to complete the record. The first time we went over to write and throw around ideas. The second time we went over to record. The third time we went over to add vocals. I did most of the vocals when I was really pregnant." The pregnancy helped March in a lot of ways. Limiting her time and making her work hard to complete the record, she didn't nit-pick or dwell over small things, letting things blossom with their 'flaws', allowing the records room to form their own life. Looking back on it, she credits the pregnancy with helping make the recorded a more original, better focused effort than past releases. "I'm very hyper self-critical," she confesses to me. "And being pregnant really didn't help that a lot. I was tired and pregnant, so I couldn't dwell over things. I'm more figgity and this gave me confidence, so I couldn't over think things. When I was pregnant, there was no time to dwell on things." Originally released in Europe on March 24, 2003 (released on P.I.A.S. America in September '03), March hired a nanny and took her 6-week old child on the first European tour in support of Triggers, a 6-week tour throughout April and part of May. "We just showed up, did our show, and then I went back to and spent time with my child," she proudly states. "It was a great experience. I was tired and just had to show up and do it and get out of there because I didn't have energy to do much else." The lack of energy that plagued her tour and the recording of the album would be a detriment to most. March, however, turned it into a positive. "The biggest thing this record taught me is this: I can just be as-is and leave stuff alone. Normally I am very controlling and I would second guess everything from my vocals to the lyrics and the ideas of the record. It dilutes things. So I learned to not do that and I can make a good record by not second guessing myself," she informs me, discussing the benefits of needing to rush and get the record done because she was pregnant. Discussing the retro-ness of her records, March is quite to point out that her new-found confidence has helped progress the sound of her record beyond the retro-tag of previous releases. "My older albums are classified as more retro. This new one, it's pretty modern, and pretty unique," says March. "It's not like a nod to the 60s. That had a lot to do with me having less confidence on past albums. We were trying to be retro. On this one we didn't do that. She further goes on to describe the difference between past albums and the new one: "I think the difference between this album and the older ones is that the older ones had less confidence. The old ones, I think at times I put on a costume to fit it. The new one is more natural, more authentic. It's less of a pose." This new found confidence has also influenced March's live performance. As she puts it, "In the past, I have been a bit more removed. There was a barrier between me and the audience. I have removed that now and there is no more barrier." The live sound brings a different element to Triggers, something March says adds to the music. "The live sound is a lot more aggressive, a lot louder. My band is really loud. We have two keyboards, a guitar player, and a bassist," she informs me. "There is a lot going on, but you can't exactly duplicate the record live. That's not my interest anyhow. It's totally different. It's more aggressive. There is a lot of stuff on the record and the live show is more stripped down and more aggressive, but it still stays true to the record." Looking back on Triggers, and listening to it now, March unequivocally states that it is indeed her favorite record. "This is my favorite record, the one Im most proud of. It's my 9th record," she tells me. "There are definitely records I've made and after I was done they weren't my favorite. But, this one is my favorite." Proud of where the new record has taken here, and reenergized with a new found enthusiasm for her own songs, March looks forward to a U.S. tour to promote the record, as well as another European tour in 2004. Quite proud of the fact that the Triggers recording sessions taught her to let go and make an album without regrets, March seems poised to make an even bigger name for herself in the U.S. with this record. "I don't hesitate or question things like I used to. I just do them. I don't hide anymore. It's not a different personality, it's just more of the real me showing. I'm not as reserved anymore," March tells me before we say our good byes and the interview is over.